zBoost Metro Cell Phone Signal Booster Giveaway! Congratulations to our winner: Serenity from Raymondville, TX! Are there rooms in your home where you wish you could use your cell phone but you just don't get a good signal? 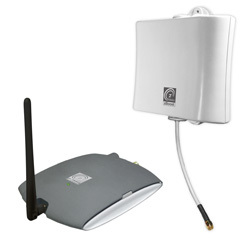 An indoor signal booster, like the zBoost METRO from Wi-Ex, can help. Designed for use in apartments and small homes, the zBoost METRO can boost signal for an area up to 1500 sq ft inside your home. Simply mount the zBoost METRO's antenna inside a window in your home where you get the best reception (using the included suction cups) and then place the base unit where you want to strengthen the cell signal. The zBoost METRO works with all U.S. cellular providers - AT&T, Sprint, T-Mobile and Verizon - and enables you to take full advantage of your cell phone's voice, data and Internet services, including 3G data, streaming video, instant messaging, sending pictures, and more. The zBoost METRO retails for $299. Enter the zBoost METRO giveaway through September 27th, 2011 for a chance to win one of your own! Sign-up for our FREE Techlicious Newsletter—be sure to provide a valid email address when you sign-up so we can contact you if you win. If you're already a subscriber, skip to step #2. Once you have subscribed, tell us in a comment below "In what room do you use your cell phone most?" Want an extra chance to win? Of course you do! Become a Fan of the Wi-Ex zBoost Facebook Page. Just "Like" it in the Facebook box and the post a second comment below for your Facebook entry. Already a fan of Wi-Ex zBoost? No worries. Just tell us below in a comment. See Official Rules below for more details. We will randomly select one (1) winner from the entries. No purchase is necessary to win. The giveaway will end at 11:59pm on September 27th, 2011. Void where prohibited. U.S. residents only. Click here for the full rules. To have this in my family room! I get best reception outside. We have poor signal reception where we live. I use the cell phone mostly in my study. I surely could use a boost. Thanks. Since we have zero bars and can receive no cell calls in the house, this would be a wonderful prize. I’m sure the room we would use this in the most would be the living room . I use my cell phone in the Man Cave at our house, which is partially undergraound and lined with cinder block walls. So the reception is not very good in that area. I use my phone most often on the front porch. Inside the house anywhere is hit or miss. I use it most in my bedroom when on the computer. Please!!! I really NEED this booster! I live in a rural area. I can get a cell phone signal, but it is very spotty. Therefore, I don’t use my cell phone at home. I would love to be able to use my cell phone here, in my livingroom where the signal is best, but not quiet good enough to use my phone. I would be so thankful, just to be able to use it at home, anywhere! My main family room area has the worst reception. Not surprising, that is where we need it the most. We don’t have a land-line and my husband uses his cell phone for work. ALL rooms need a boost, but most particularly the living room and office. Winning one of these would be outstanding! I use my cell phone in the kitchen while I’m cooking and cleaning up. Let’s just say I’m killing two birds with one stone. Back bedroom has less reception capabilities. I use my cell phone in my living room the most. Here in hilly Western Oregon the cell signals usually stink no matter how close you are to a signal relay tower, so anything that would help boost my cell phone signal would be most welcome! Thank you! I use my cell phone mostly in the backroom (office?) in my house. I really need this for my daughter who is away at college. She gets no reception in her dorm room so she has to go to open areas close to a window and has no privacy when she is on the phone. This would allow her to use her phone in her room. When I’m home, I use my cell the most in the kitchen/great room. But our signal is poor in the basement, and people who visit us who use other carriers can’t get signal at all, so the Zboost might make a big difference. Thanks for this offer! I could really use this at the campground where I work in the summer. reception is not great here, we get to many dropped calls! Living Room tops the list. I could use this in my living room, I get dropped calls all the time. What room do you use your cell phone in? We use it mainly in the bedroom. on the dining room table. furry pet skooching to do it. Where I use my cell phone. I use my cell phone mostly in the living room and kitchen. mine is definitely the kitchen,I can use all the help I can get!! I use my cell phone in the living room the most. My husband gets frustrated when he tries to call from our bedroom. what room i use my phone the most? do you maen thaT YOU HAVE TO LIKEIT ON FACEBOOK OR IS YOUR COMMENT DIRECTED AT SOMETHING ELSE..
Live in apartment and need more signal strength in the living room. I use my cell ALL the time! I could so use this because I use my cell ALL the time in my home office and reception is sometimes spotty. Yep, I’m in! Here in Atlanta suburbs the ATT signal is horrible. So will use in the bedroom. In my bedroom window, it’s the only place I can get good service. i can currently only get get cell calls in some of the house and would love better reception in the whole house. I use my cell phone phone mostly outside in the back yard. That’s where the reception is better but still spotty. I would love to have decent reception for any room inside the house! I use my cell phone the most in the living room since there is only one place in our home we get signal and its in one of the living room windows. So to use our cell phones at home we prop our cell phones up in the one window that gets signal and then have to use bluetooth headsets to talk and leave the phone on the window. So we NEED this. I have been looking at them to buy one but dont want to spend that amount for something I am not sure how well it works and only place I found them is online so it would be a pain to have to return.So crossing my fingers and toes hoping to win. Thanks for the GREAT giveaway and I also subbed to your emails some time back that is how I found out about the giveaway.